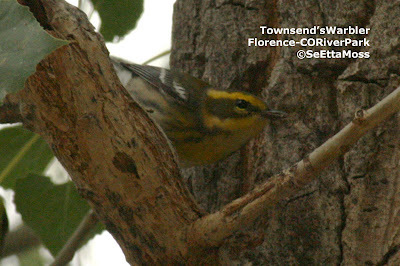 The day after I enjoyed that wonderful mixed flock of birds in Florence River Park I returned to see if any had extended their stay. Only a few remained at this location. 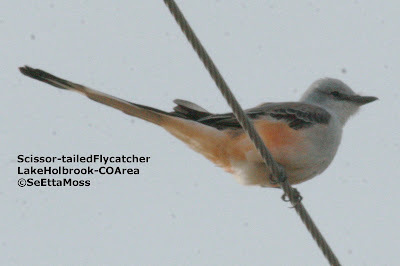 However, a very nice flock of around a half dozen migrating White-throated Swifts had made this location a feeding stop. 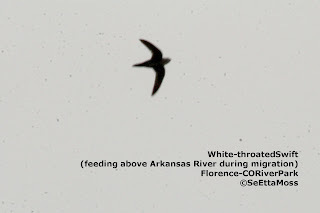 They sometimes flew quite close to the Arkansas River as they picked off the apparent abundance of insects on which they feed. Boy oh boy, do they move fast! Trying to get a reasonable photo was a real challenge. While not great (terrible back lighting so virtually no features) I think these photos show some interesting views of these highly skilled flyers. 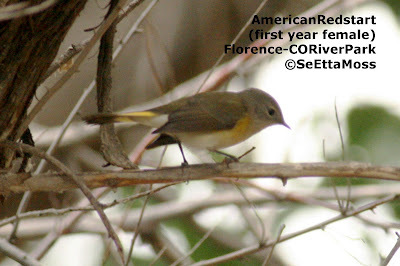 This is the 'Western' Flycatcher I found in Florence River Park last week foraging in the mixed flock with the American Redstart I posted about below. 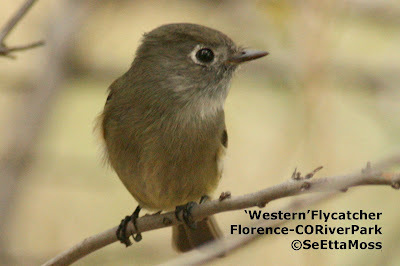 The Western complext of flycatchers is the designation for both the Pacific-slope and the Cordilleran since they are so similar in appearance they cannot be safely separated in the field as noted in updated field guides. 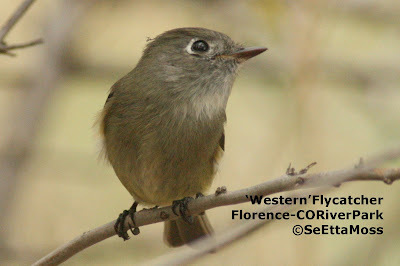 In the top pic the overall brownish mixed with olive coloration with darker breast band is prominent as is the distinctive eye ring that is extended to the rear of the eye.